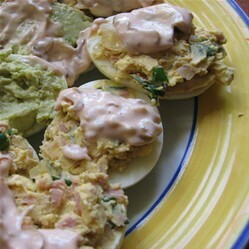 When it comes to quick and delicious snacks, devilled eggs are very high on my list. As fancy as you make them, they can be easy yummy treat or posh party food. Let me share with you a few well-tried recipes that I come back to over and over again, plus one fancy technique to make your devilled eggs REALLY sophisticated. Chop ham and green onions finely, add to the yolks. How many recipes for devilled eggs do you know? 3-5 - after all it's such a gracious dish. More than 5 - I'm an eggmaster! Slice the eggs in half lengthwise, remove yolks. Chop the onion into tiny, tiny bits. I mean - really tiny. The smaller the onion bits, the better your eggs. Mix yolks, skinless avocado, onion and ketchup into fine paste. Fill each egg half with the stuffing. You can be generous, there's usually some left over anyway. 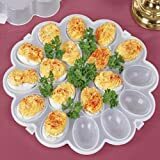 What is the proper name - deviled eggs or stuffed eggs? I always use devilled. (With 2 'l's because I'm a Brit). This is definitely my favourite variation. Slice mushrooms very thinly, fry until golden. If you're using onion, you have two options: you can either chop it roughly and fry with the mushrooms (fry the onion first, add mushroom when it starts 'sweating') or you can chop it really, really finely and fry it separately on low temperature gas. The second technique takes longer (and you have to stir the onion constantly, especially at the end), but you'll get lovely, golden and crispy onion that tastes quite delicious and completely transforms the dish. Mix yolks, onion and mushrooms, season with salt and pepper. Fill egg halves with the mixture. How to serve devilled eggs? What you need now is some sauce! - A mixture of ketchup and mayonnaise. My absolute favourite. Ready in seconds. Tasty and... well, pink. - There's nothing wrong with a splash of ordinary ketchup or mayonnaise! I have learned it from a good friend of mine. If you want to make your deviled eggs really unusual, don't peel the eggs! Cut them in half lengthwise with the shell and all. There's a knack to it, but you'll quickly get it, just make sure you use a sharp knife. Remove the whole egg, taking care not to damage the shell. You can use both yolk and chopped white for your stuffing, preferably with some mushrooms, onions and ham. Fill the shell-halves with the stuffing, cover in breadcrumbs and quickly shallow-fry the flat side. This will give your eggs delicious, crunchy crust. Polish cuisine has its own version of gnocchi: kopytka, delicious potato dumplings. It is not so important what they are called as long as they are delicious. Ahhh. Mushroom eggs. Avocado eggs. Just...eggs! Amazing recipes! thanks for sharing. The mushroom eggs seems my favorite too!